The Rubbermaid® broom sits well in the hand with its vinyl-coated metal handle, reliably reaching every corner thanks to a sloping bristle cut. 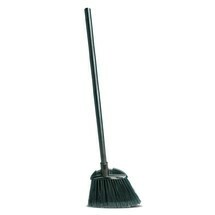 It removes dirt efficiently and sweeps ergonomically from a standing position. 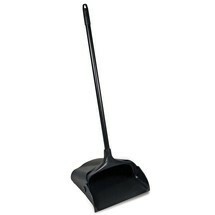 The Rubbermaid® long-handled dustpan enables you to ergonomically brush together the collected dirt while standing. The wheels incorporated in the pan allow for easy transport and ensure that the dirt is disposed of reliably.